A high-complexity barcode library that “enables the high-resolution tracking of more than 1 million cancer cells under drug treatment”. This library is offered in two sizes, depending on the number of cell lines you want to barcode. This library will be delivered as DNA in microcentrifuge tubes on blue ice. The tube's contents will not necessarily be frozen. For best results, minimize freeze-thaws. NOTE! The primers in this PCR procotol have been updated since the paper was published. Please use the primers described in this protocol. NOTE! This algorithm software contains minor bug fixes and a new “library_mode” geared toward analyzing plasmid library complexity. Current stock of the library can be used for experiments of less than or equal to 1 million total cell infections. 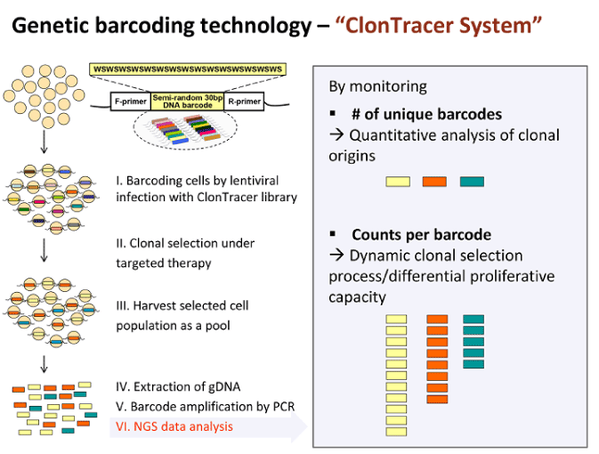 Studying clonal dynamics in response to cancer therapy using high-complexity barcoding. Bhang HE, Ruddy DA, Krishnamurthy Radhakrishna V, Caushi JX, Zhao R, Hims MM, Singh AP, Kao I, Rakiec D, Shaw P, Balak M, Raza A, Ackley E, Keen N, Schlabach MR, Palmer M, Leary RJ, Chiang DY, Sellers WR, Michor F, Cooke VG, Korn JM, Stegmeier F. Nat Med. 2015 May;21(5):440-8. doi: 10.1038/nm.3841. PubMed.